Collection of Knowledge Sheets on Love by Sri Sri | Diaries of Swapnil. Collection of knowledge sheets by Sri Sri Ravishankar on Love. There are three kinds of Love. The Love that comes out of Charm, that which comes out of comfort, and the Divine Love. Do you see what I am saying? The love that comes out of charm does not last long. It comes out of unfamiliarity or out of attraction. In this, you lose the attraction fast, and boredom sets in, like most love marriages. This love may diminish and bring along with it fear, uncertainty, insecurity, and sadness. The Love that comes out of comfort and familiarity grows. But this Love has no thrill, no enthusiasm, joy, or fire to it. For example, you are more comfortable with an old friend who is a familiar person, rather than with a new person. The Divine Love supersedes both the above. The Divine Love has ever newness. The closer you go; there is more charm and depth. The Divine Love has comfort, enthusiasm, and familiarity. There is never boredom and it keeps everyone on their toes. Worldly love can be like an ocean, yet an ocean has a bottom. The Divine Love is like the sky which is limitless, infinite. From the bottom of the Ocean, soar into the vast sky. To know more about Divine Love, refer to our Bhakti Sutras. Sri Sri: You wish someone of what they dont have ? Right ? 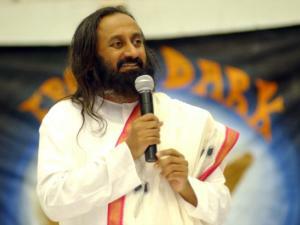 Sri Sri: When you say Best Wishes, you imply that they are not best NOW I tell you, NOW is the best. If you realise this tomorrow can only be better. You feel a lot of love for someone and they do not take it. What do you do? …and you have seen that none of these work. They only make the situation worse. What is the way out of this? How do you maintain your lovingness? Have patience and change your expression of love. Be centered and limit your expression of love. Sometimes over-expression of love puts people off. Take it for granted that they love you too and accept their style of expression. For example, a mother with three kids. One child talks, one child does not talk, one child throws tantrums. Mother’s love is the same irrespective of their behavior. Genuinely acknowledge their love for you. This will turn your demand into gratefulness and the more you are grateful in life, the more love comes your way. Know that hurt is part of love and take responsibility for it. When you move away from your center, you will definitely get hurt and the nature of worldliness is misery. When you love something, you have a sense of belongingness with it. You can only love something, because it is belongs to you. If it is not yours, you cannot love it. Love is the shadow of the Self. The bigger the Self, the bigger the shadow, and the bigger the love. When the love is cast over the entire creation, then you are the Big Self. That is the Lordship. When the Lordship dawns on the Self, there is perennial celebration. Suppose someone shows a lot of love to you, what do you do? Often you do not know how to respond. You feel obliged and bound. Try to reciprocate even though it is not genuine. Doubt the love expressed and ones own worthiness. You are afraid of losing respect because love does not allow distance and respect tends to keep distance. Your ego hardens and does not allow you to receive and reciprocate. Anything else. (Fill in the blanks). Love is not an emotion !! It is your very Existence !!! Abiding in the self you become the valentine for the whole world. Spirit is the valentine of matter and matter is the valentine of the spirit. They are made for each other. They uphold each other. If you hold onto matter and do not respect the spirit, then matter is not pleased. If you honor the spirit then you will care for the world, and when you care for the world, it will take care of you. I am the valentine of the whole world and I reside in every heart. If you are my valentine, you will see me everywhere. Have the same love for everyone, with different flavors. You cannot behave the same way with everyone, but you can love all of them the same. Love transcends behavior and etiquette. You feel comfortable with someone who does not question your love, someone who takes for granted that you love them. Isn’t it? If someone doubts your love and you constantly have to prove it, this becomes a heavy load on your head. When someone doubts your love, they start questioning you and demanding explanations for all your actions. To explain everything you do is a burden. Your nature is to shed the burden, and so you don’t feel comfortable. You are a witness to all your actions. You are as much a stranger to your own actions as you are to someone else’s. You are the Eternal Witness. When someone asks for an explanation, they are speaking from doership and imposing that doership on you. This brings discomfort. If somebody is just there with you, like a part of you, they don’t question you. They are like your arm. There is thorough understanding and questions don’t arise. Neither demand an explanation nor give an explanation. There are some who are longing for change. Feeling that everything is stagnant in their lives, they want to change partners, careers, dwellings. And there are some who are scared of change. They feel secure the way they are. There are some who see the change, but don’t acknowledge it out of fear. There are some who do not notice the change at all. There are some who do not think there is anything to change. And there are some who realize that everything is changing, yet see there is something that is non-changing. Those who recognize the non-changing amidst the change are the wisest of all. Question: Must love as well always change? Sometimes she slaps the child. She does this out of love, and these are all different modes of love. So, the expression of love changes but love itself does not change, because love is your nature. Only one who has renounced can truly love. To the degree you have renounced, to that degree you have the ability to love. Often people think those who renounce cannot love, and those who love cannot renounce. This is because so-called renunciants do not seem to be in love, and so-called lovers are very possessive and are in need. True love is non-possessive and brings freedom, and renunciation is nothing but freedom. Only in freedom can love fully blossom. When in love you say, “I want nothing, I just want this.” Renunciation is, ” I don’t want anything. I am free.” In love there is no other need. Renunciation is having no need. Love and renunciation, although appearing to be opposites, are two sides of the same coin. Tara asked — Does this mean the lover renounces his beloved? Guruji responded — You renounce the attachment, the possessiveness. Renunciation doesn’t diminish love; it enhances it. Only renunciation can sustain love and joy. Without renunciation love turns into misery, possessiveness, jealousy and anger. Renunciation brings contentment and contentment sustains love. Without renunciation one gets discontented, frustrated, sad, fearful, suspicious, analytical. And the whole soap opera begins. And this is what we find in society , don’t we? The so-called renunciants have run away from life frustrated and disappointed. Real renunciation is born out of knowledge and wisdom, knowledge of life in the background of time and space and in the context of this magnanimous universe. Love is your nature. But in the process of its expression, you often get caught up in the object. This is when your sight is caught outside. To return back to your nature, you need insight. Pain is the first insight. It takes you away from the object and turns you towards your body and mind. Energy is the second insight. A bolt of energy brings you back to your Self. Divine Love is the third insight. A glimpse of Divine love makes you so complete and over rules all the relative pleasures. Trance is the fourth insight. An elevation of consciousness and partial awareness of the physical reality around is Trance. The conviction in the non-dual existence, that all is made up of one and only one, is the fifth insight. When love glows, it is bliss, When it flows, it is compassion, When it blows, it is anger, When it ferments, it is jealously, When it is all Nos, it is hatred, When it acts, it is perfection, When love Knows, it is ME! How can we reconcile the impersonal with the personal? In love you raise the object to life. When you love an object it becomes life. For children everything is personal. Children take each object they play with and make it totally personal. Even a stone has a face; even the sun laughs. When you attach emotion, the whole creation becomes personal. When you remove the emotion, even people become objects. Violence is removing the emotion. How a person can kill another person: it is when they do not see them as a person, they see them as an object. But even a stone attracts reverence when it becomes personal. Dean says: In military training they teach soldiers to see people as killing objects coming toward you that need to be killed first. Susannah says: In the temple even a stone is elevated to the level of spirit. The impersonal cannot attract reverence. Most people see God as impersonal and therefore they do not progress. something, we make it real. So then, what is reality? You are the Reality. You are not the thoughts, you are not the emotions nor actions. You are not even a person…! Exercise: What you now see as impersonal, see it as personal. And when you feel any negative emotion towards anybody, see them as impersonal. And pretend that you yourself are a robot. In a congregation, Sri Sri asked, ” How many of you are feeling strong?” Many people raised their hands. Because YOU are with us!!! Sri Sri : “Only those who feel weak can surrender”. All those who were feeling strong were taken aback! If you are in love, you feel weak because love makes you weak. Yet there is no power stronger than love. Love is strength. (All those who had raised their hands for strong suddenly felt weak!). Yet love is the greatest power on earth. You feel absolutely powerful when you are with the Divine. Why would someone tell a lie to their close ones or to their beloved? This is a question most often asked by lovers. Since love cannot stand untruth, this causes relationships to break up. The solution lies in understanding the paradox of love and truth. People tell lies just to save and maintain their love. The fear that the truth might damage their love causes lies to be told between husband and wife, boyfriend and girlfriend, parents and children and in family situations. No one wants to sacrifice love. Thus people are ready to give up the truth for their love. Love takes the luster out of truth. Sometimes truth can make love bitter while in love even lies can appear sweet, like Krishna’s lies to his mother Yashoda! The truth that does not nourish love has no sense and the love that cannot withstand the truth is not true love. When one is assured that the love is so strong that the truth can neither break it nor cause bitterness, then the truth prevails and love shines. Truth has judgments, but true love is beyond judgments. Thus true love makes you weak and yet it is the greatest strength. There are two types of respect. Respect that comes to you because of your position, fame or wealth. This type of respect is impermanent. It can be lost once you lose your wealth or status. Respect that comes because of your virtues like honesty, kindness, commitment, patience and your smile. This respect, no one can take away. The less you are attached to your virtues, the more self respect you have. If you get attached to your virtues, you look down upon everybody else, and the virtues start diminishing. Non- attachment to virtues brings the highest self respect. Often one confuses ego with self esteem. Ego needs the other for comparison; self esteem is just confidence in oneself. For example, a gentleman claims that he is thorough in Mathematics or Geography, this is self esteem. But to say that I know better than you, that is Ego. Ego simply means lack of respect to the Self. Ego upsets you very often. Self esteem is immune to getting upset by external factors. In self respect, everything is a game, winning or losing has no meaning, every step is joy, and every move is celebration. Do you love someone, because they are great or unique?I tell you – you are hopeless! Why do you love someone? Is it because of their qualities or is it because of a sense of kinship or intimacy? You can love someone for their qualities and not feel a sense of kinship. This type of love gives rise to competition and jealousy. Such is not the case when love arises out of kinship. If you love someone for their qualities, then when the quality changes or you get used to the quality, love also changes. However, if you love someone out of kinship, because they belong to you, then that love remains for life-times. People say “I love God, because He is great”. This is no big thing. If God is found to be ordinary, just one of us, then your love for God collapses! If you love God, because He is yours, then however God is, whether He creates or destroys, you still love Him. The love for kinship is like the love for yourself. Question: Many people do not have love for themselves? Answer: No! It is the other way around. They love themselves so much, that they want better qualities and better appearance for themselves. This love of qualities makes them be hard on one self. If love is based on the quality of a person, then the love is not stable – after sometime the qualities change and the love becomes shaky. Loving someone because of their greatness or uniqueness is Third-rate love. Loving someone because they belong to you, great or otherwise, is unconditional love. Knowledge, Sadhana, Seva and Satsang help to bring about a sense of belonging in no time. When love springs forth from a sense of belongingness then the actions and qualities do not over shadow the love. Neither the qualities nor actions can be perfect all the time. Love and a feeling of kinship alone can be perfect. I read all the things but i did not find my quest…I love a girl but i seems that i am getting it tough to feel and express for her which i had before. I felt very stress about this and for fluctuation of my mind several times the girl also get confused, also feeling unsecured to me. I want her to be with me. Our families are interested to talk. I have to be with her for 2 yrs before marriage. So i bothers in between this if i get fluctuated then it will be a very rough for her. I think about her well and good.. Right now she does not speak to me at all and reason is my unwelcomed fluctutation of mind..Plz anyone help me..If not then make it quick otherwise it will bring pain for both of then in future…help guruji… I have been waiting for long… I will be waiting for ur answer in mail..Lastly the question is how cud feelings devoloped ??.. I am totally confused plz help me….